Ubuntu 14.04 and Ubuntu 14.10 uses Unity as its default shell. Unity is much more than a shell it is the base concept of using a single user interface to all kind of devices from TV, Mobiles to Desktop. 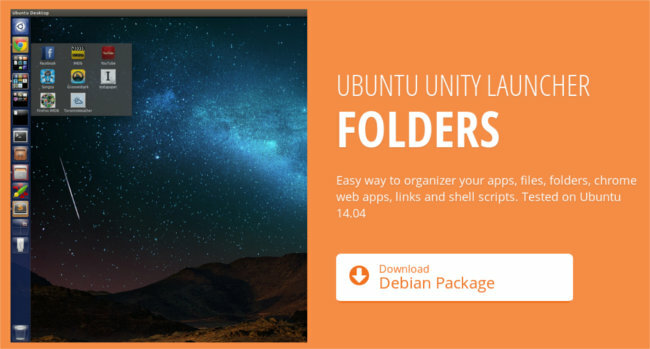 Launch Folders is an awesome application to ubuntu unity. It integrates a super easy way to organize applications in Ubuntu Unity sidebar. A user can categorize applications and creates different folders in unity sidebar. Its like circle shortcuts in android home page or folders in gnome shell application overlay. It contains application shortcuts, file shortcuts, folder links, web url links, script shortcuts etc. If a user click on a launch folder it expands to show the contents. It is a very quick way to access favorite apps and folders. Run or Edit Shell Scripts. This will install the programme. Life simplified.